A certificate of deposit (CD) can boost your earnings at the bank, but it requires that you lock your money up for several months or even years to achieve earn the interest. A CD laddering strategy can help you keep some flexibility, ensure a bit of cash flow, and potentially maximize your earnings. It involves buying multiple CDs with maturity dates at various times in the future. CDs come with strings attached. You have to wait until a CD matures before you can pull money out—at least if you want to avoid paying a penalty that could possibly be more than what you earned in interest. You can buy what's known as “liquid CDs" that allow you to withdraw funds at any time, but these products tend to pay less interest than traditional CDs. A CD ladder is a simple strategy that can help avoid early withdrawal penalties. $2,500 goes into a one-year CD. $2,500 goes into a two-year CD. $2,500 goes into a three-year CD. $2,500 goes into a four-year CD. You would cycle your maturing funds back to the end of the ladder each year beginning with the original one-year CD's maturity. The original two-year CD now has only one year left until maturity, the original three-year CD has only two years left, and the original four-year CD has three years. You just have to replace the four-year CD—which you'll do with your original one-year CD—to get your original ladder design back. The cycle continues each year. You can get more complicated, adding six-month intervals or longer-term CDs, but managing the ladder becomes more difficult as you add more variety. You might have the time and desire to build an intricate ladder now, but that could change in the future and everything could fall apart if you don't stay on top of things. How Long Should Your Ladder Be? The answer to this question depends on what you’re trying to accomplish. CDs with long maturities pay higher rates because you’re taking more risk regarding interest rates and liquidity, so a longer CD ladder should earn you a little bit more. But you might actually earn less if rates rise quickly after you set up a long-term ladder while interest rates are low. Decisions depend on your timing needs and how the future unfolds. Most people stop at three to five years. You should be comfortable with locking your money up if you're going to go long term. It’s wise to speak with a Certified Financial Planner to explore long-term strategies that best fit your goals. How Far Apart Should the Rungs Be? Should you use three-month or two-year CDs? The easiest approach is CDs with one-year maturities because the CD ladder becomes a high-maintenance project if you include too many variables, although many savers enjoy six-month CDs. Just know that if it takes more work, you might be less likely to keep the ladder in action. But you can get creative with CD ladders to accomplish any goal you have. For example, you might time the maturities to match predictable expenses like upcoming tuition payments. You might not have to wait for long if you need cash flow from your CD ladder. One of your CDs should mature soon enough—providing liquid cash without penalty—and hopefully you won’t need all your money at once. A ladder can particularly optimize cash flow in retirement when you can pinpoint how much money you'll need each year to meet expenses. You can plan to cash out each CD as it matures yearly to supplement your income in that year rather than reinvest and build again onto the end of the ladder. You’re typically stuck with the interest rate that's available when you buy and invest money in a CD. That works in your favor when rates are high, but seeing rates go up after you’ve locked in a low rate is always unfortunate. But you’ll continually reinvest over time when you build a CD ladder, so you’ll update your rate periodically. A CD ladder allows you to avoid making predictions about interest rate movements; wherever rates go, that’s what you’ll start earning. But if you can predict that rates are about to rise, you might wait to build your ladder or keep maturities on the short end. Likewise, if you know that rates are about to fall, a ladder that skews toward longer maturities might make sense. A CD ladder can serve as a fixed component of your overall financial plan. 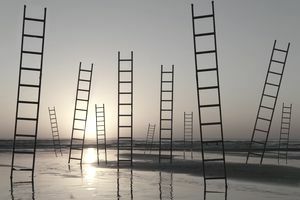 As low-risk investments, CD ladders can anchor more volatile investing, particularly when your ladder is at least partially composed of at least one long-term, jumbo CD. Conventional wisdom tags jumbos at $100,000, but you can purchase them in denominations of $10,000. The returns might not be remarkable compared to your other investments, but they should be steady and safe. Make no mistake—a CD ladder is a long-term project. Early-withdrawal penalties can more than wipe out your earnings if you have to break down the ladder and cash out. A savings account or a money market account would be more liquid and allow for penalty-free withdrawals if there's a chance you might need the money sooner rather than later. Of course, there's no way to anticipate unexpected emergencies, but try to honestly assess your financial future, at least for the next few years, before you begin building a CD ladder. A bullet investment strategy might work if you know when you’ll need to take your money out of CDs and you don’t want to keep cycling. Buy all your CDs so that they mature at the same time. You might buy them over the course of several years, but you’ll choose maturities that occur at roughly the same time. This strategy can be useful when you can anticipate a known expense. You’ll buy short-term and long-term maturities with a barbell approach. Instead of spreading your maturity dates out over time, stick to the longest and shortest options available while skipping intermediate-term CDs. For example, your holdings might consist entirely of six-month CDs and four-year CDs, with half your money in each. Staying on top of your ladder maturity dates is a must. Some banks automatically renew CDs. You don't want to find yourself locked into terms that might not suit your ladder strategy or best interests. Banks also are in the business of making money. You'll likely be the target of sales pitches as your CDs near maturity, with frenzied bank representatives attempting to sell you on different investment products that might or might not meet your long-term goals. Do not, however, make the switches they are recommending if they will undo your ladder.